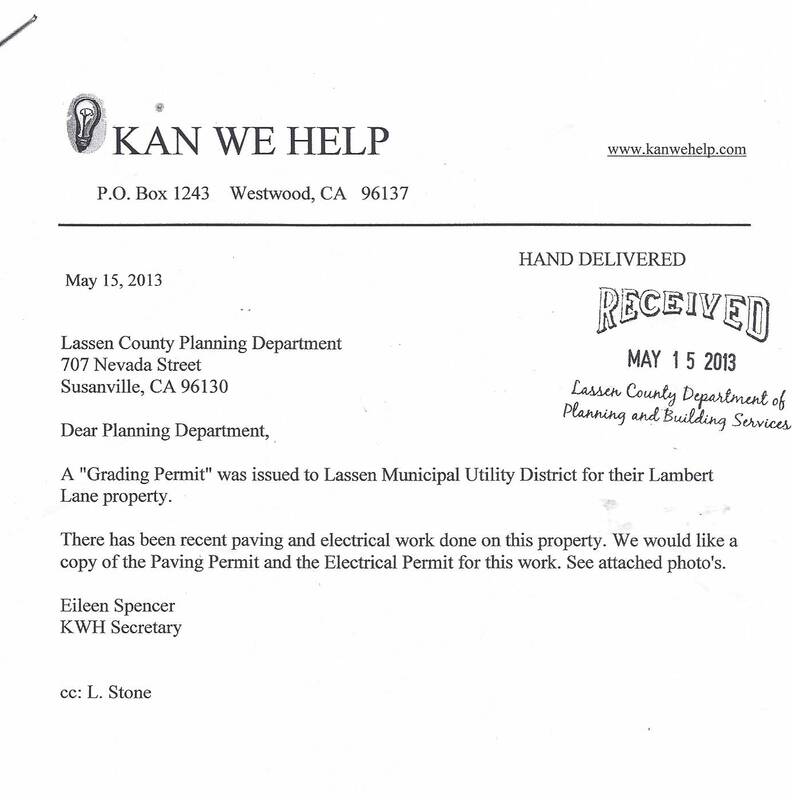 The Lassen County Administrative Officer is mandated to maintain a Capital Improvement Plan. 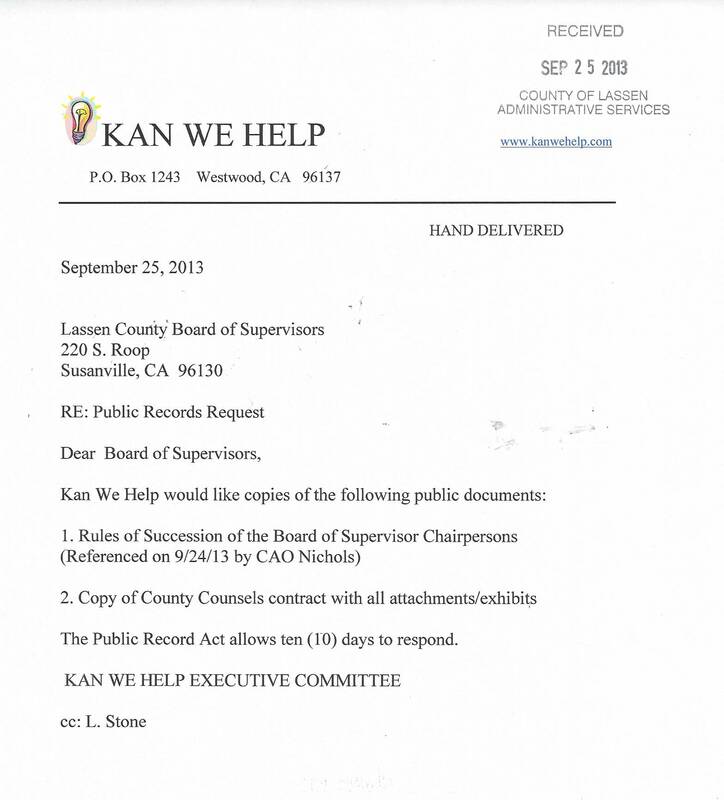 CAO Martin Nichols has not done that. 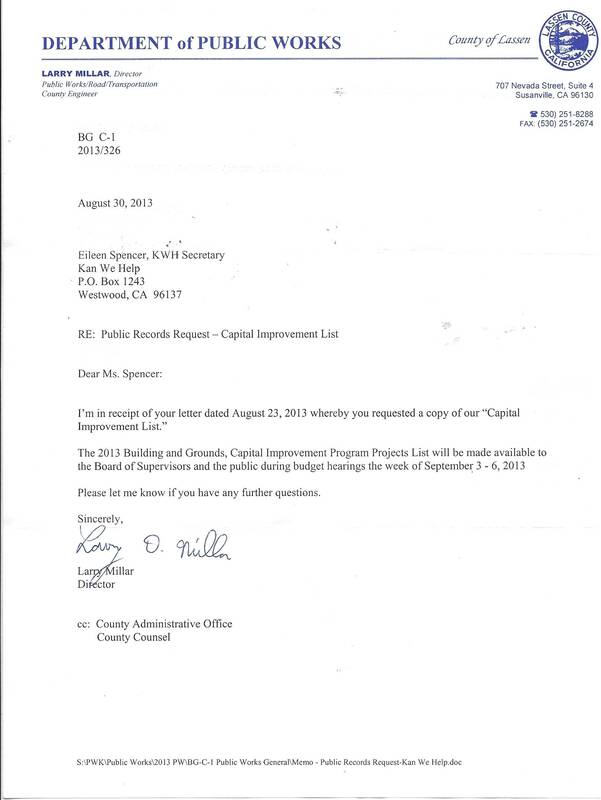 A Capital Improvement List has been maintained by the Public Works Director. 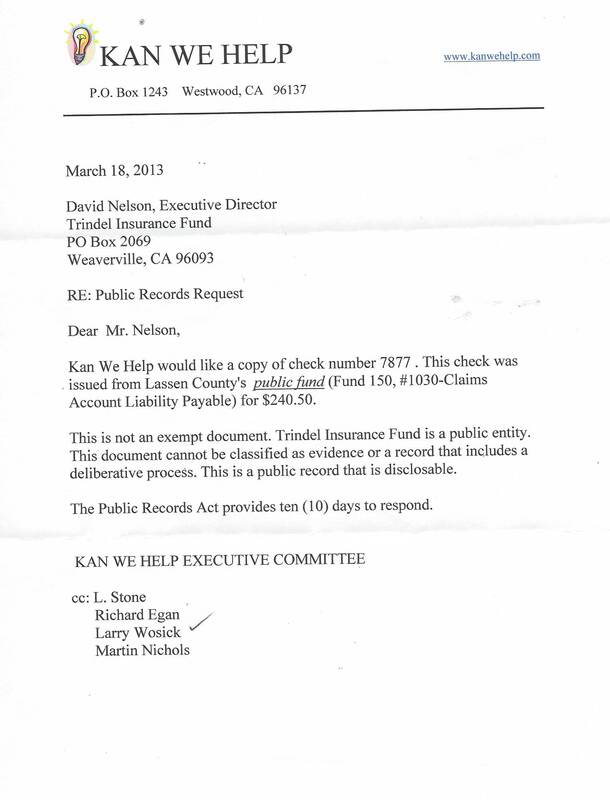 Martin Nichols is covering up the fact that he has not done his mandatory duty. 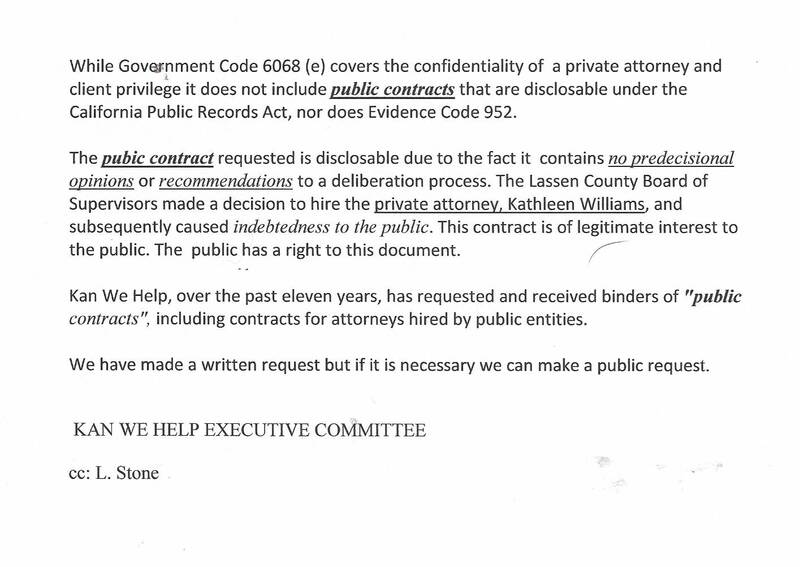 Now, Mr. Nichols has obstructed all requests to obtain a public record. 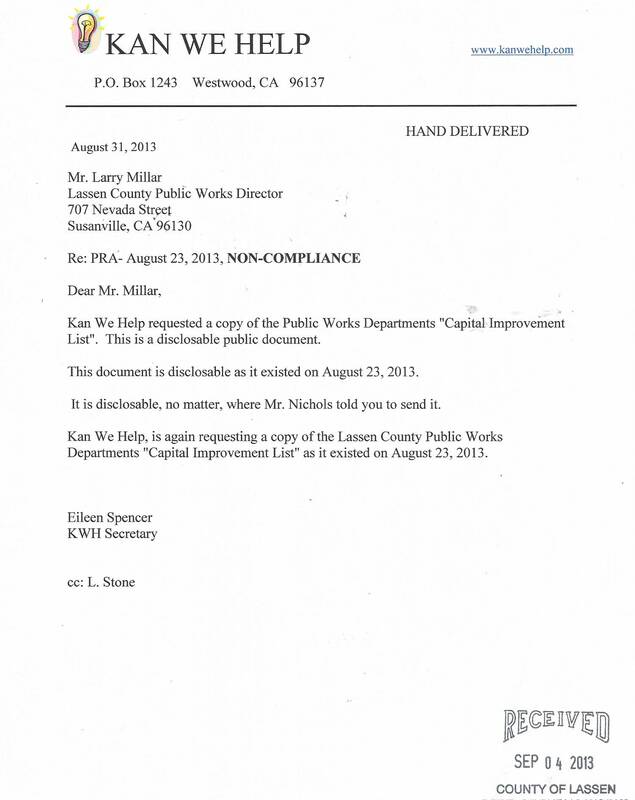 Nichols has instructed County employees not to make available an existing public document, Capital Improvement List, that has been maintained by the Public Works Department. 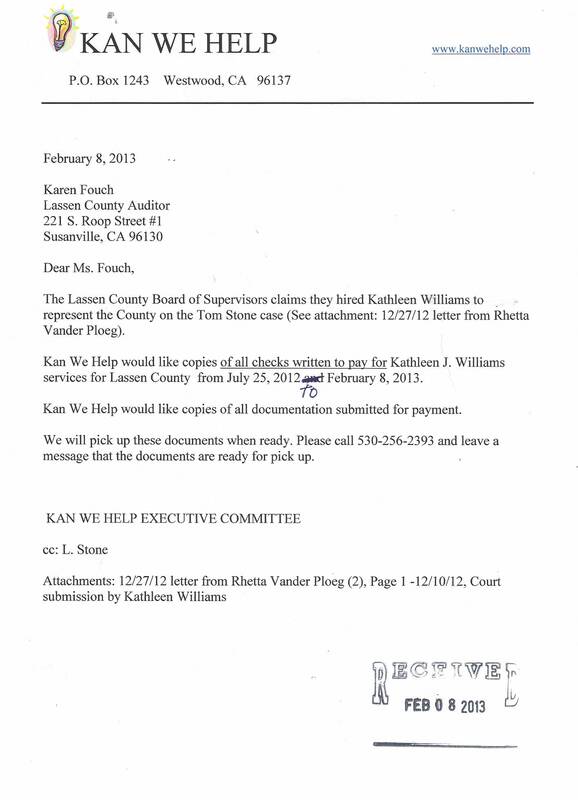 The County Clerk is charging an extra $1.75 to certify this document. 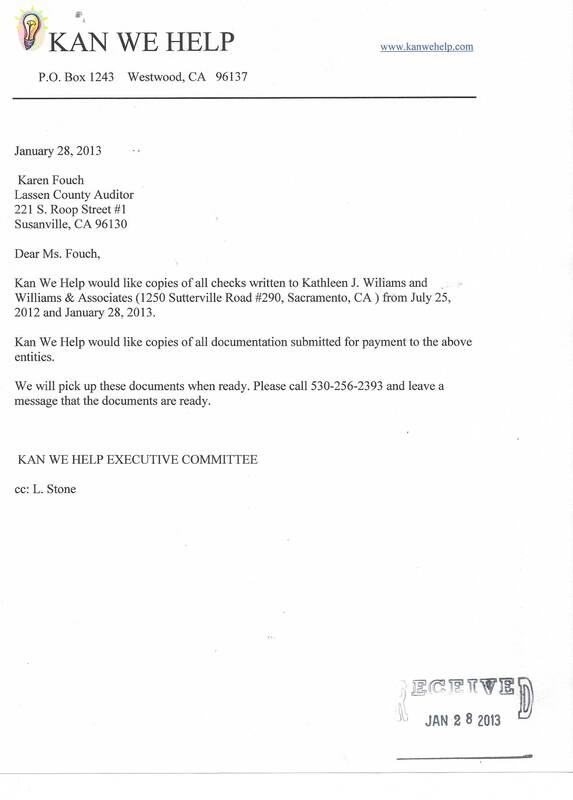 The document was certified on January 23, 2007. 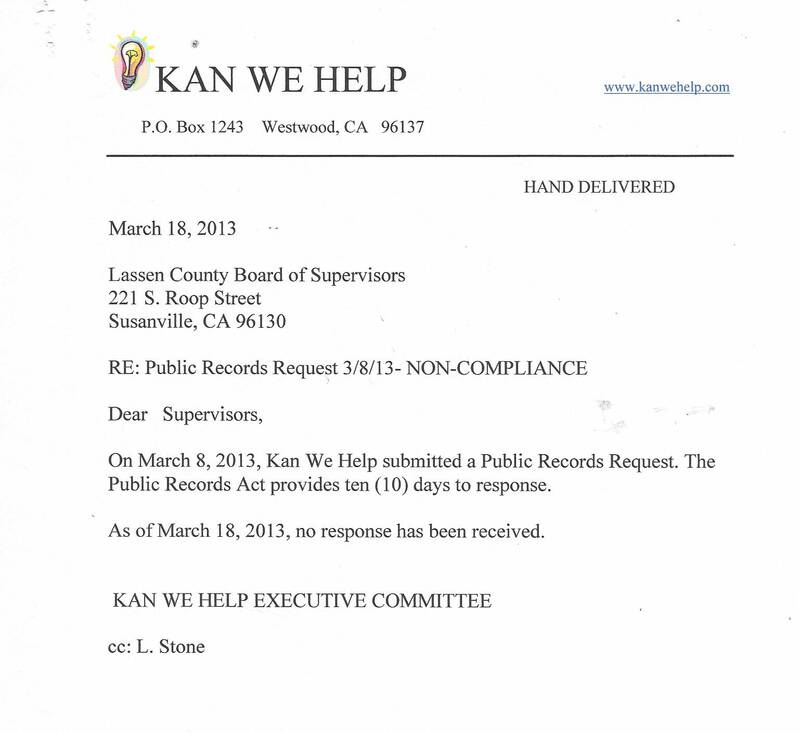 Kan We Help asked for a copy of this ordinance. 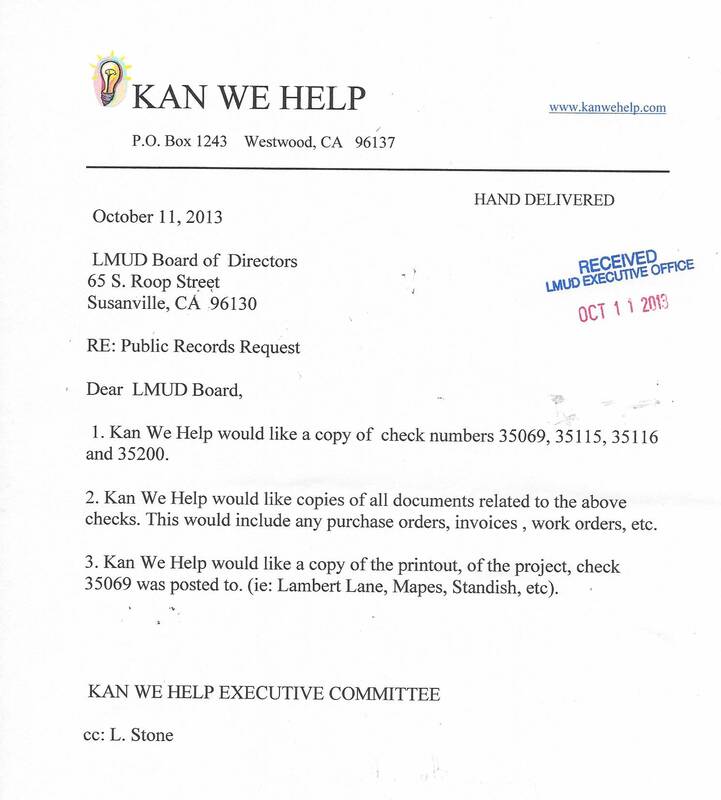 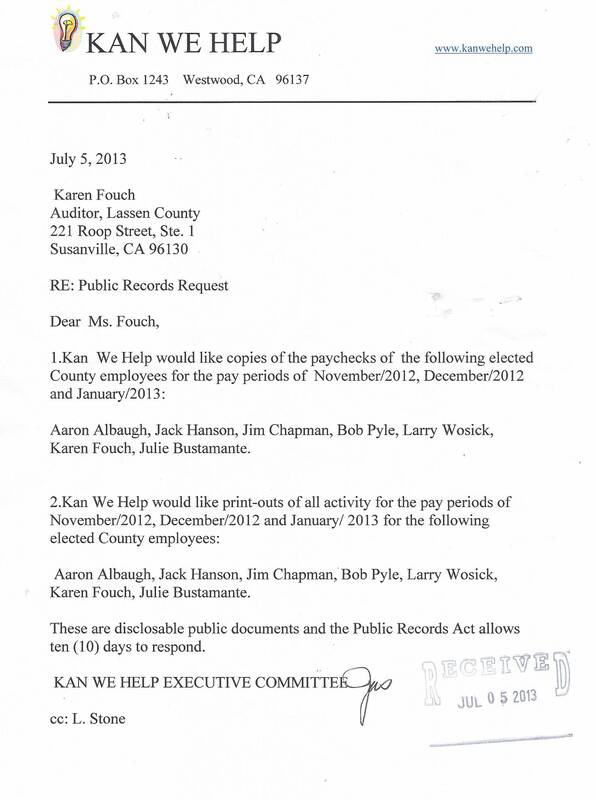 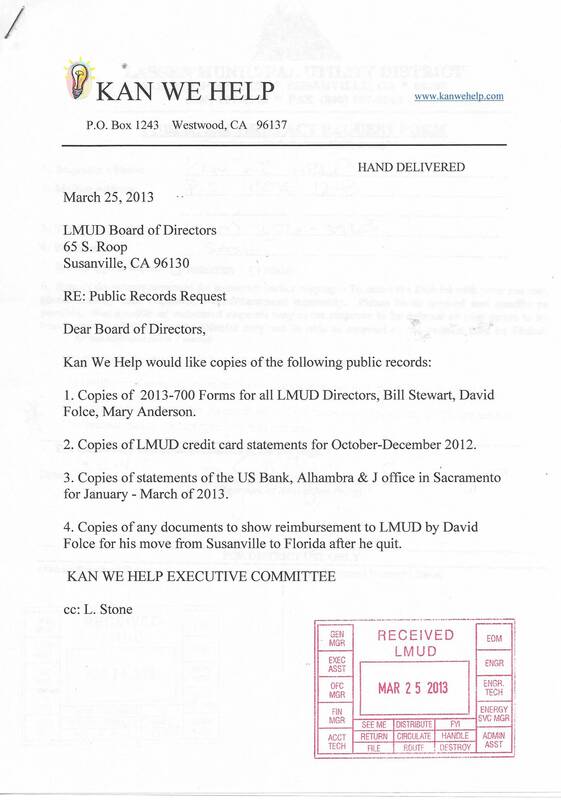 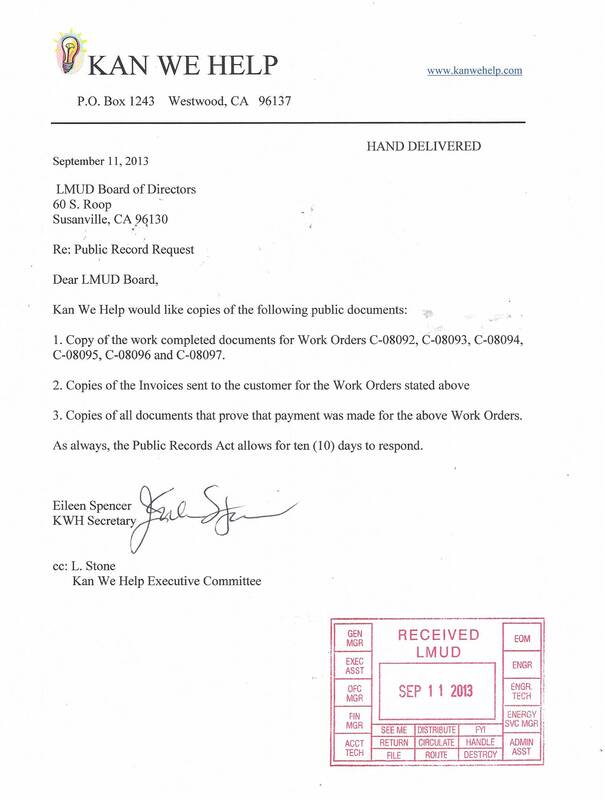 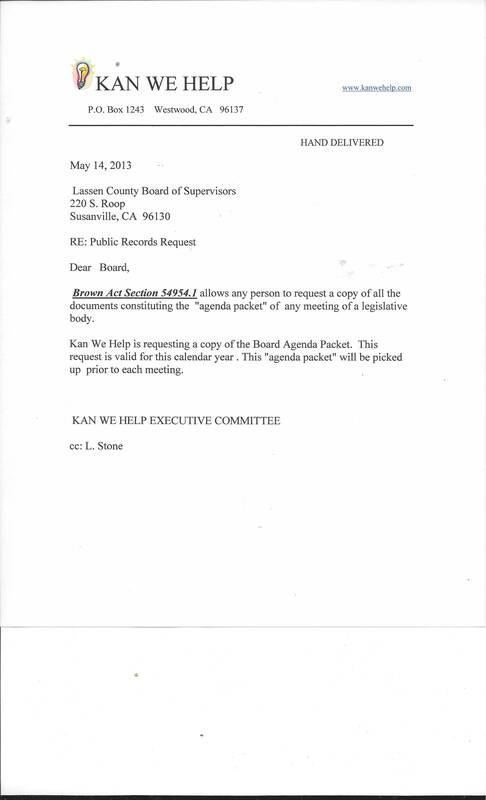 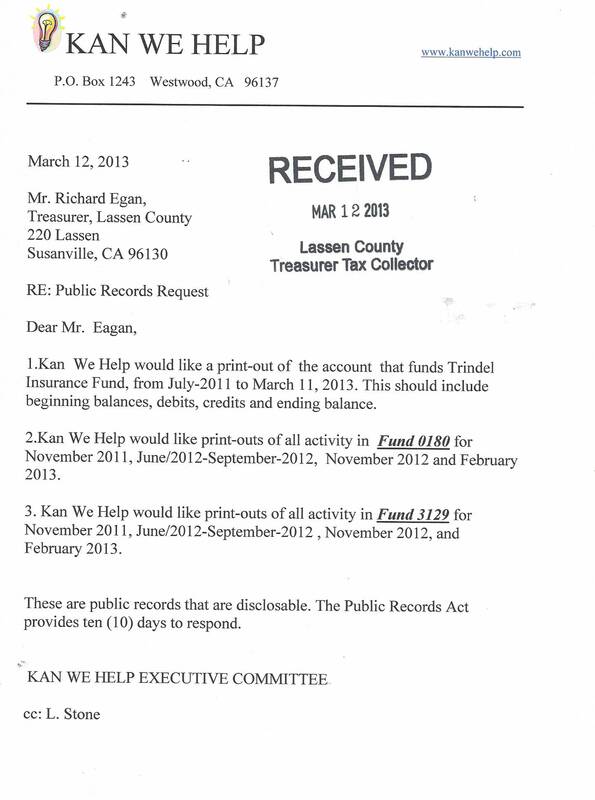 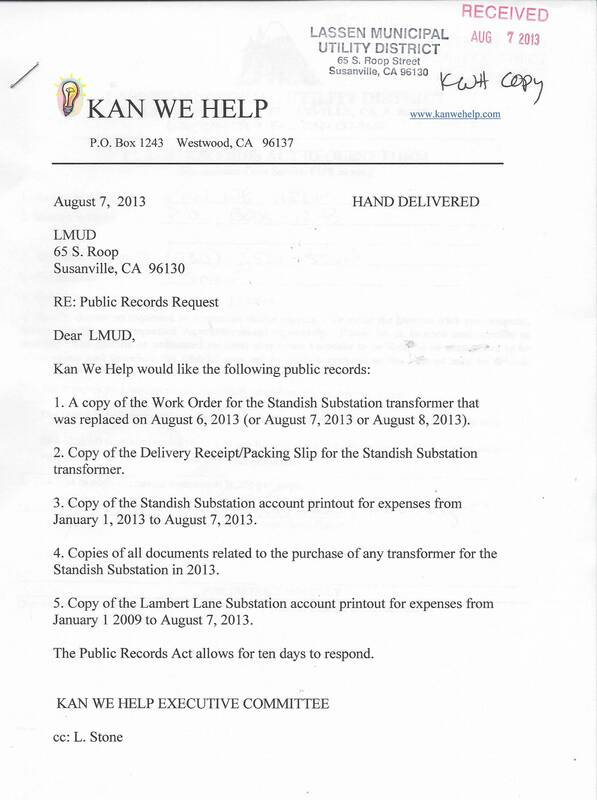 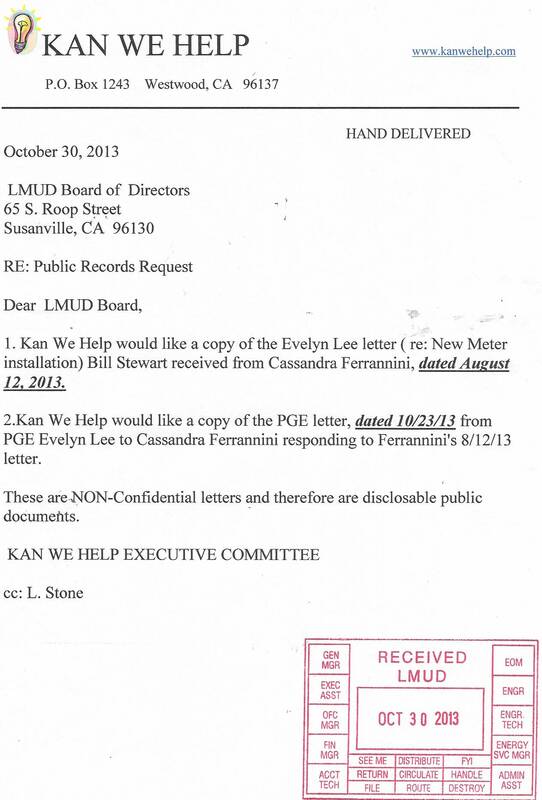 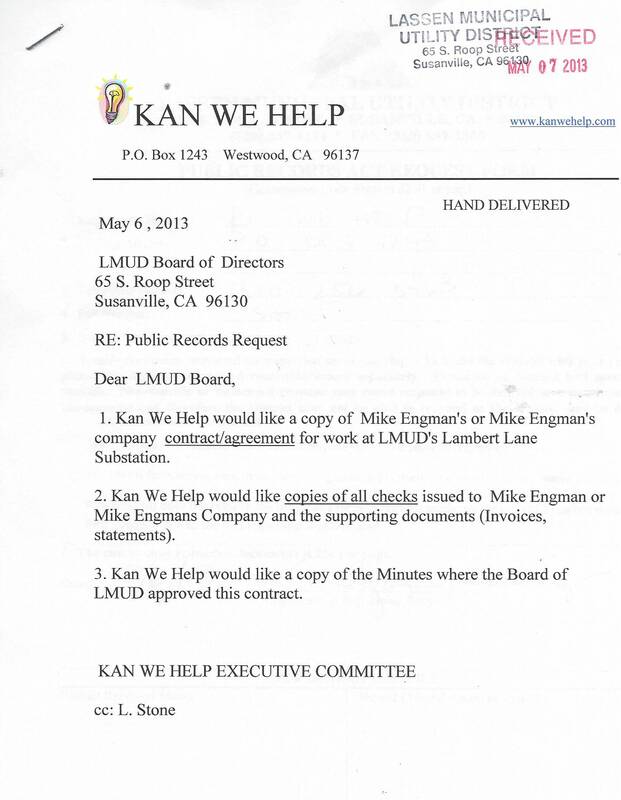 Lassen County Clerk has responded, to this public document request, and intends to charge $148.00 for this packet.. 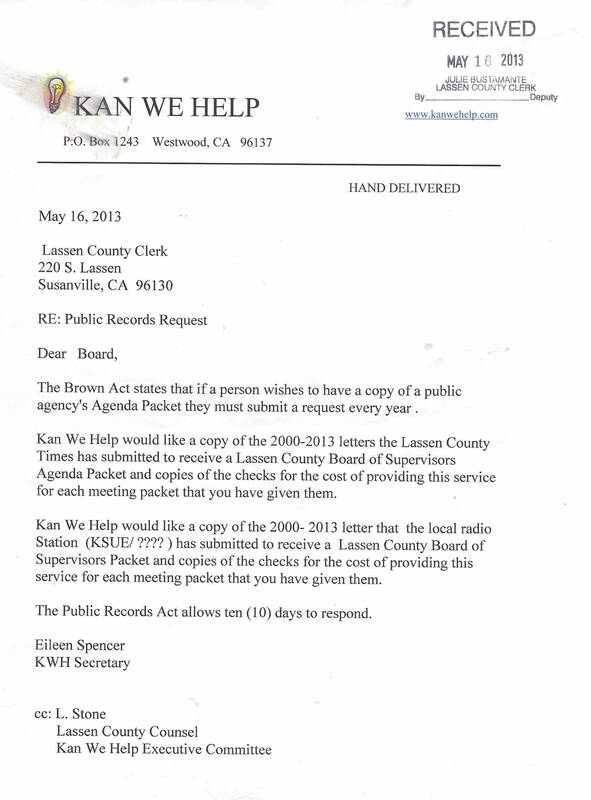 The Brown Act 54954.1 states the only charge/fee that can be assessed is postage if the documents are mailed. 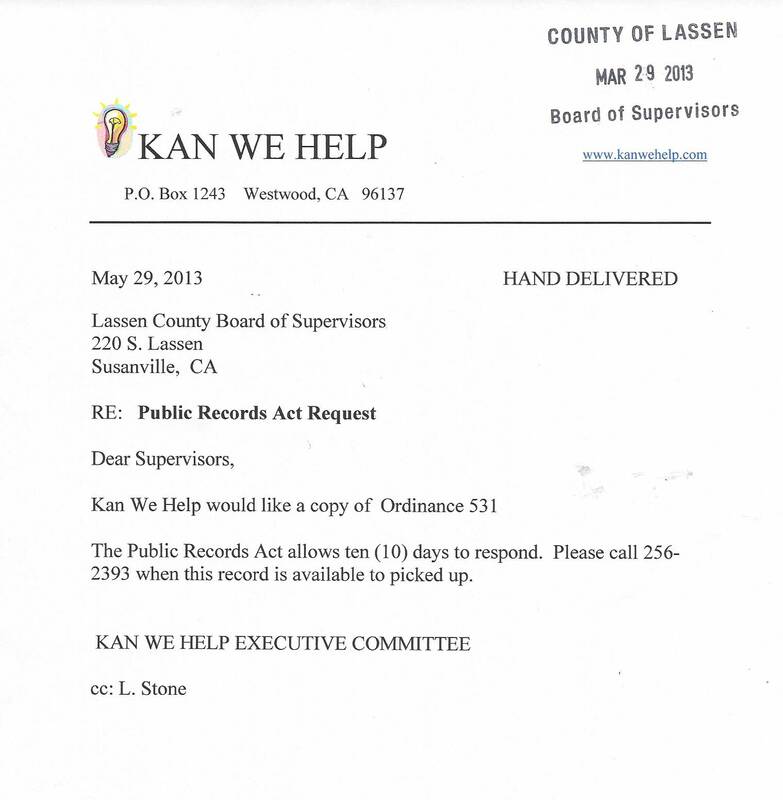 Any person can request a copy of the Lassen County Board of Supervisors Agenda Packets and pick it up for free. 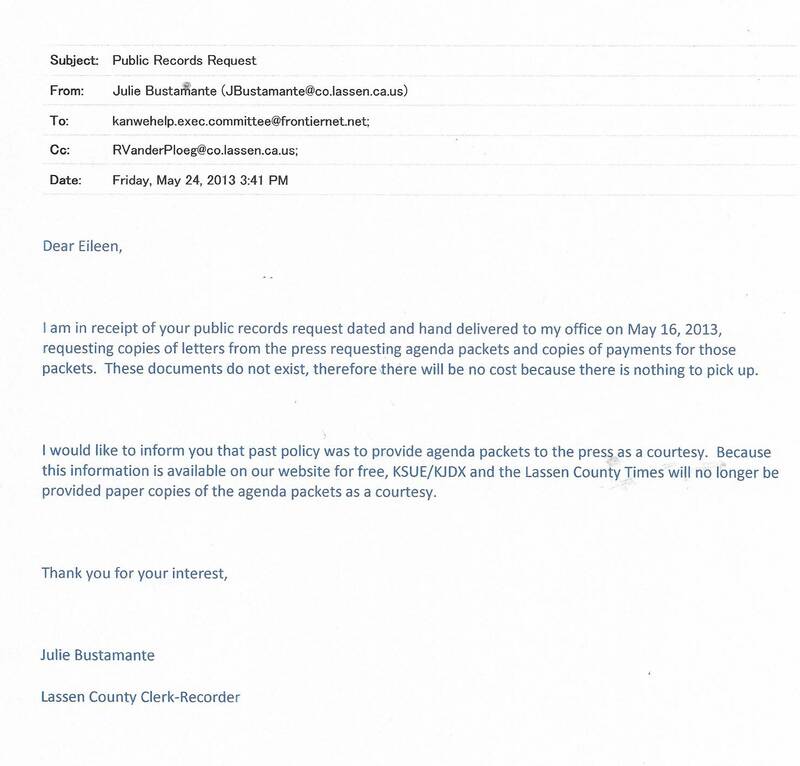 The official response from Lassen County Counsel is that the any person or company must pay for a copy of the Agenda Packet. 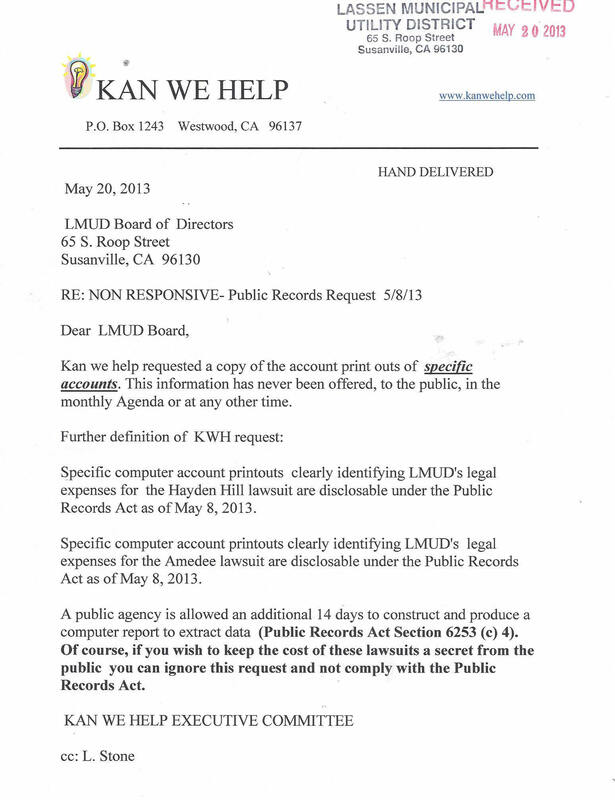 5/18/13: LMUD non-responsive. 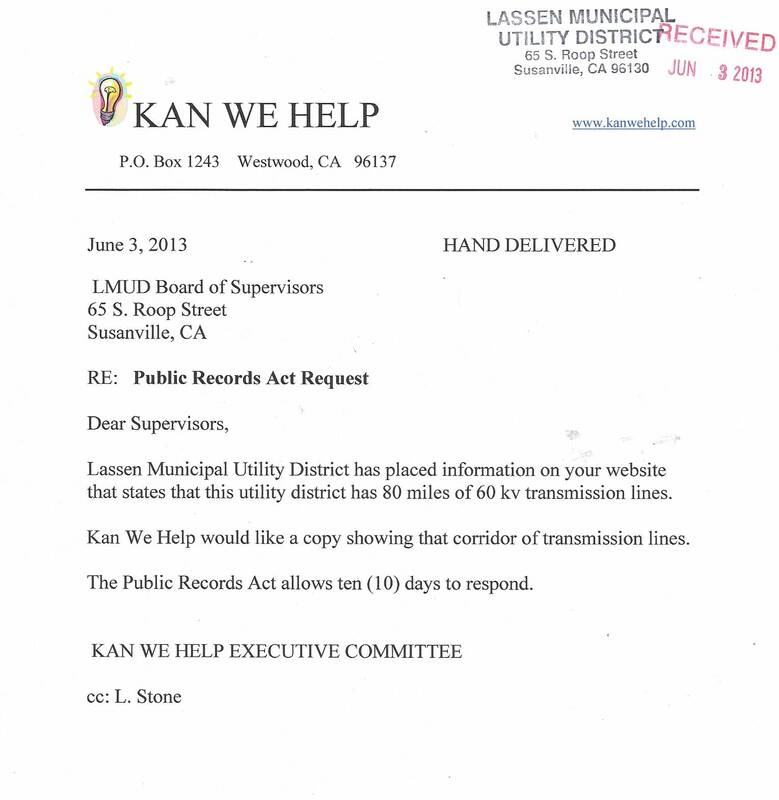 Claims this information is provided monthly to the public. 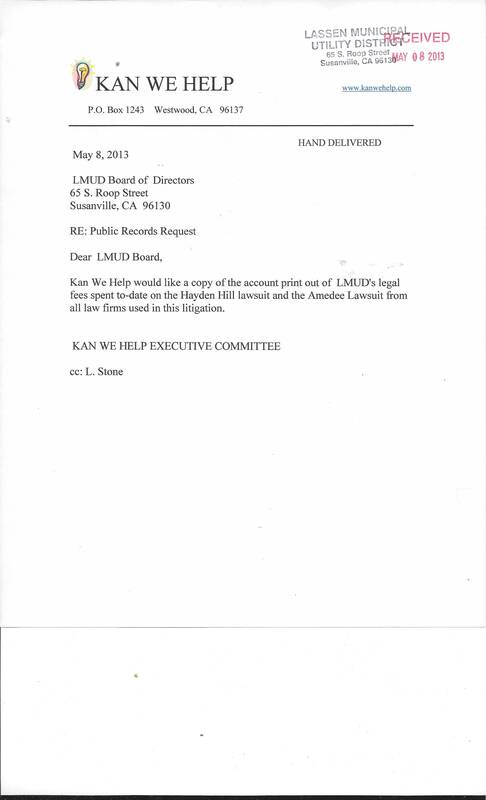 Non-responsive letter sent to LMUD (see below)LMUD has not claimed a need for an additional 14 days to produce this data. 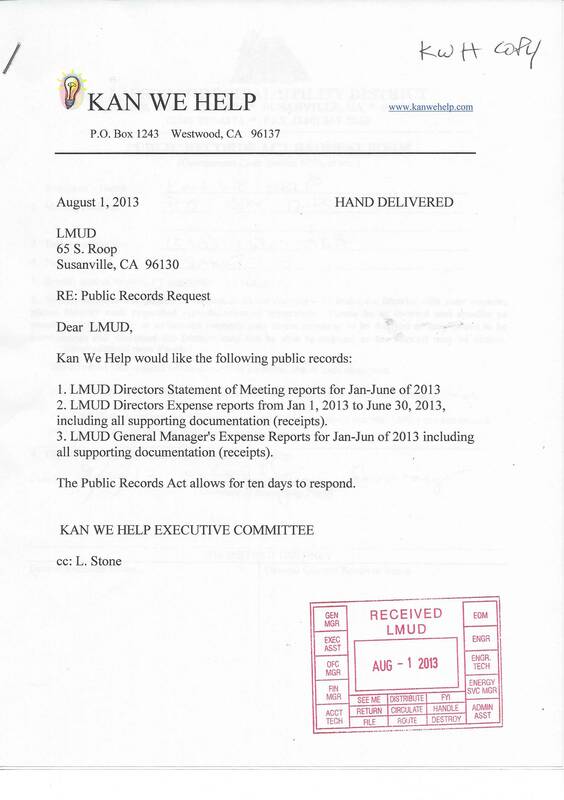 LMUD has until June 1, 2013 to produce this data. 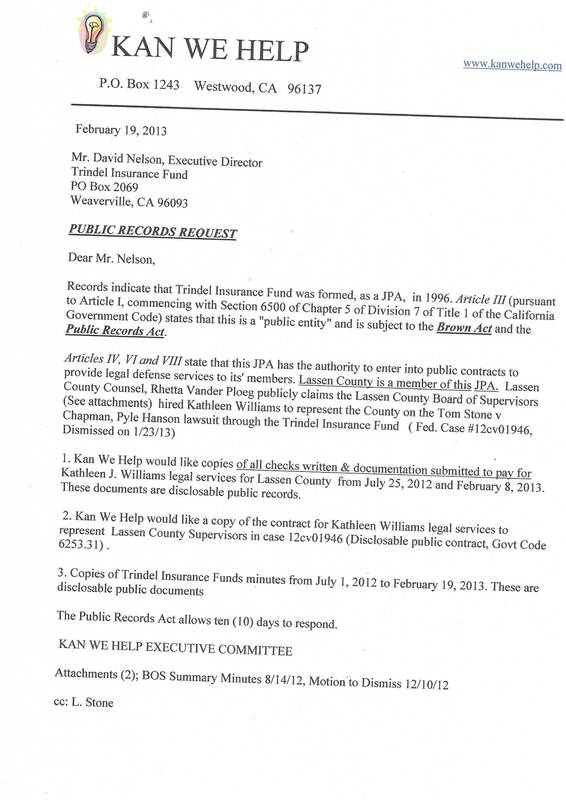 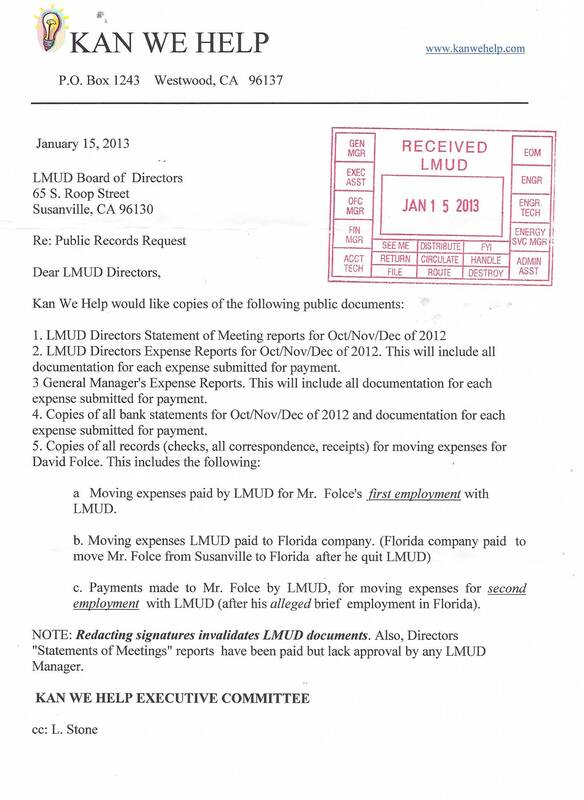 The Auditor provided only copies of checks for Lieber Cassidy Whitmore. 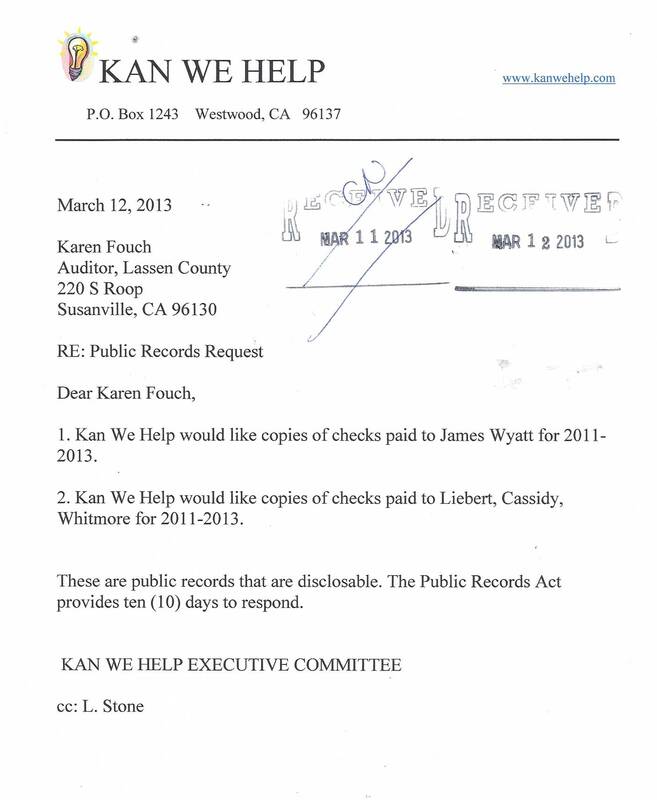 Auditor claims exemption for James Wyatt. 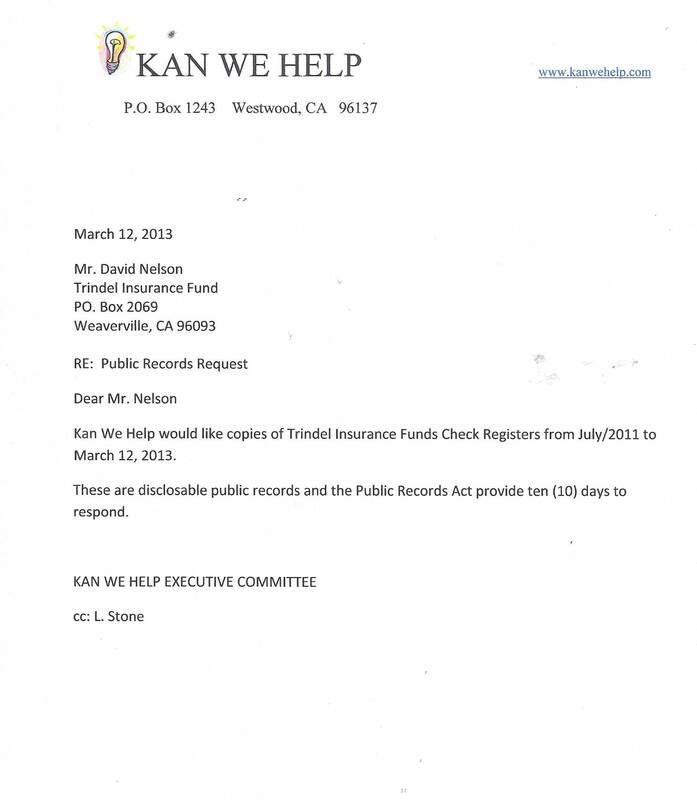 Checks written by a public entity for payment of services are disclosable. 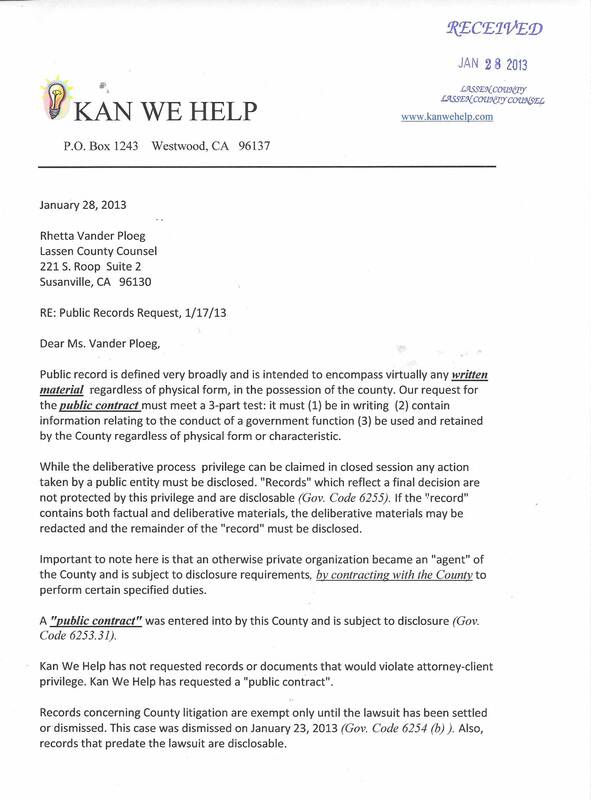 They do not contain any deliberative process or attorney client privilege. 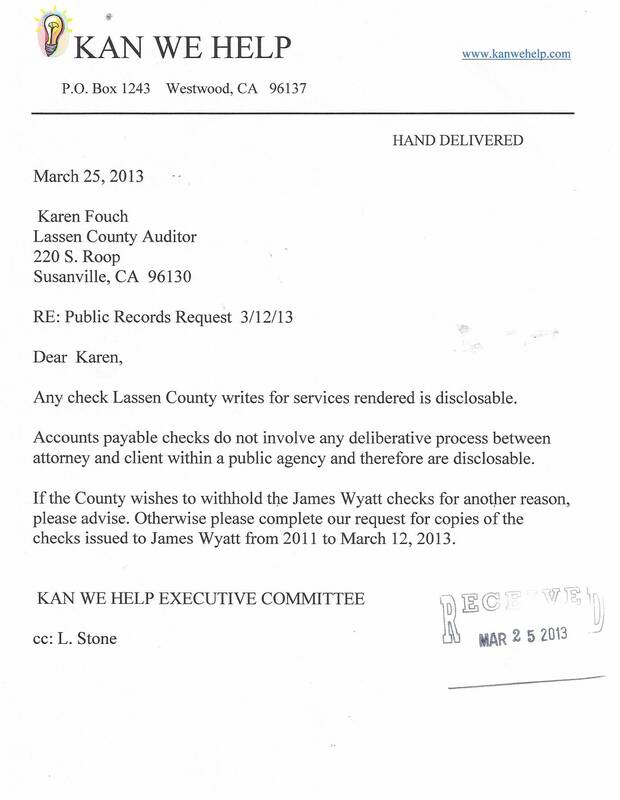 The Lassen County Audtior states that no checks were written to pay for "services". 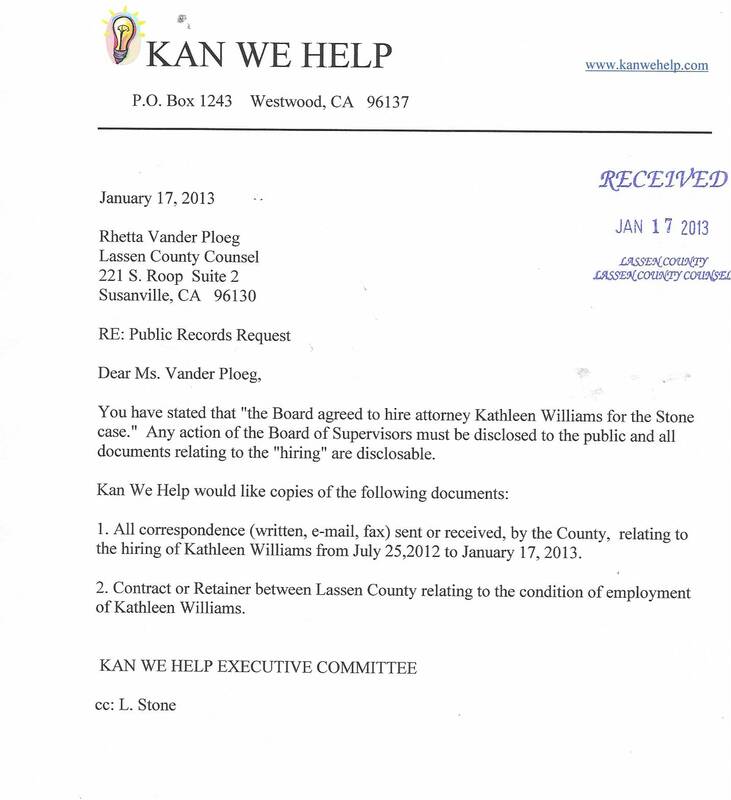 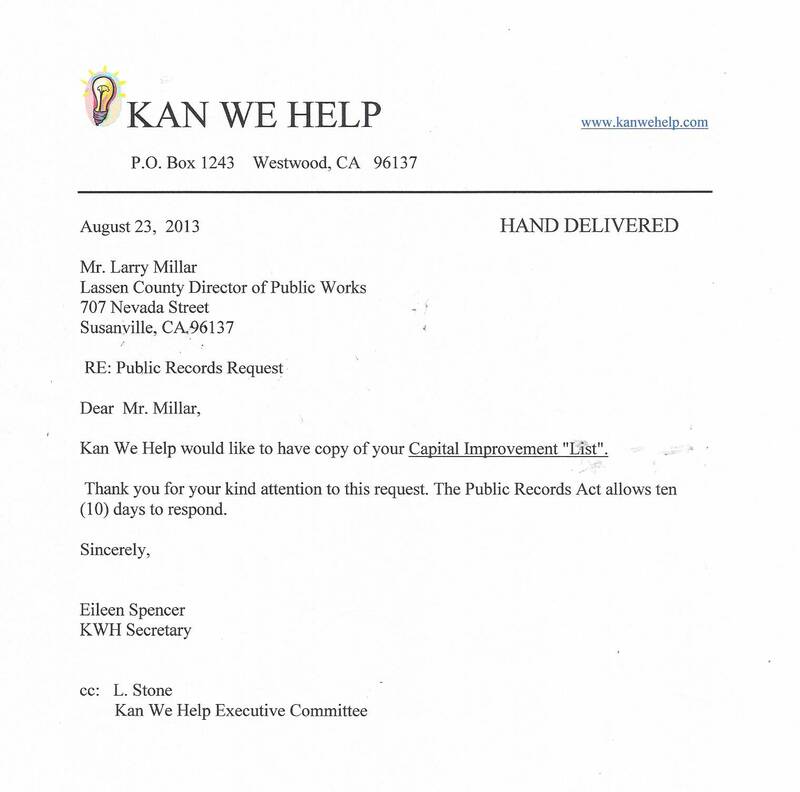 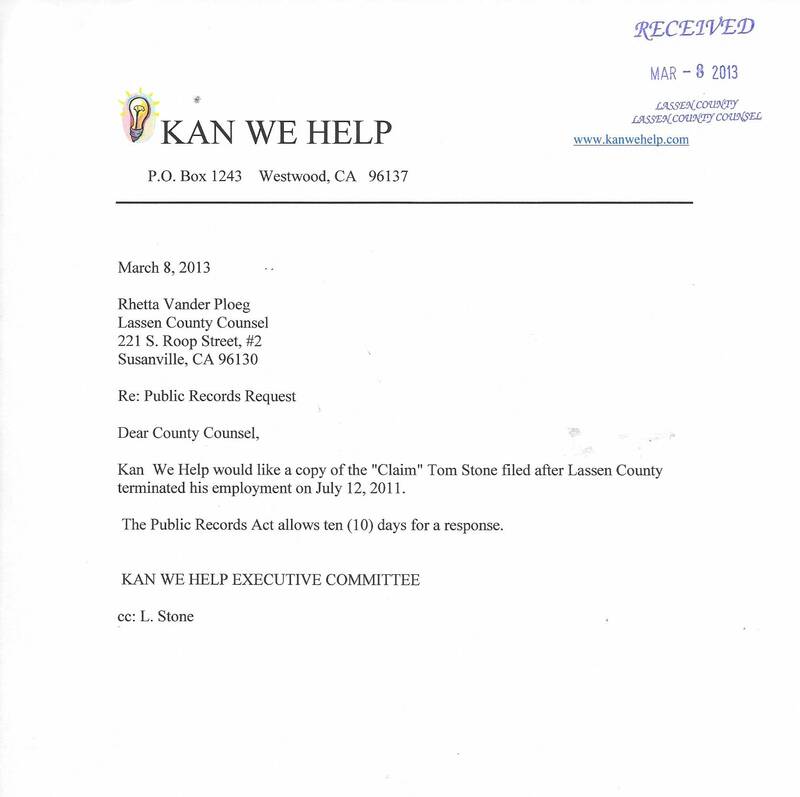 Lassen County Counsel claims that the BOS hired Kathleen Williams but does not have a contract or any documentation for her services for the Tom Stone Case.